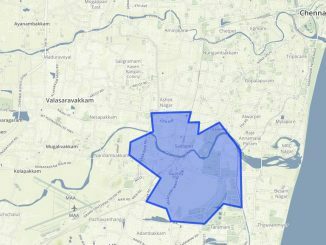 Villivakkam, once the largest Assembly Constituency in Chennai, now has over 2.52 lakh voters from Viduthalai Guruswamy Nagar (South) , Ayanavaram, Nagammaiyar Nagar (South), Panneerselvam Nagar, Villivakkam (North) and Villivakkam (South) . After the delimitation in 2008, Kolathur, Madhavaram, Ambattur, Maduravoyal, and Virugambakkam were carved out from it, while parts of Purasawalkam were added to make the constituency in its present form. Before delimitation, the constituency has seen DMK, AIADMK, CPI (M), TMC(M), and INC in power. DMK’s candidate B. Ranganathan was the MLA of Vilivakkam during 2006-11 . He had defeated G. Kalan of AIADMK by a margin of 30,116 votes. DMK is campaigning hard to win this constituency back. He was accused of involvement in a murder case by the victim’s family. AIADMK’s sitting MLA J.C. Prabhakar is contesting against M.K. Stalin in Kolathur constituency which was carved out of Villivakkam. The party has fielded the councillor of Ward 98 M. Rasu popularly known as ‘Thadi Rasu’. 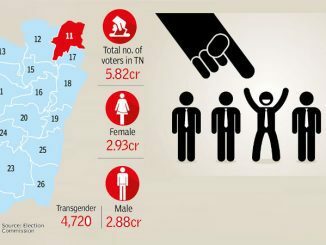 A significant section of the voters in this constituency are employees of industrial estates in and around the area, and the coach factory in Perambur. Speeches and hand-outs in Telugu points to the candidates’ attempt to woo the Telugu-speaking population here. Like the nearby Perambur constituency, the residents of Villivakkam battle with the problem of flooding during monsoons and sewage overflow. “The sewage pipes are clogged and the existing drain water storms are not maintained properly. Every time they clean the drains and heap the silt and garbage on the banks. The next rain carries it all back to the drains. This exercise is pointless,” explains Vijaya Kumar, an auto-driver from SIDCO Nagar. The residents demand removal of encroachments and reclamation of Villivakkam lake which is covered with water hyacinth. SIDCO Nagar, which now has around 13,000 houses, was built on Villivakkam lake, and it was no surprise that it was one of the worst affected areas during the December floods. Floods being an important political plank this elections, the candidates have promised to build more storm water drains and sewerages. Encroachments and illegal buildings even in areas like the High Court Colony are other factors that stifle the waterways. Difficulty in accessing government services and corruption are among the issues that leave the residents infuriated. “ If we approach government offices, we end up spending days or even months to get things sorted. But, if we pay middle men; for instance, driving schools in the case of getting licenses, things will be done in no time. This system is convenient for the rich,” says Manikandan from Villivakkam. Like many other constituencies, drinking water supply, and lack of access to Public Distribution System are everyday concerns for many residents. Though a few infrastructure developments like vehicular subways and bus terminus were undertaken recently, the residents said that a lot more needs to be done to improve transport and sanitation facilities.